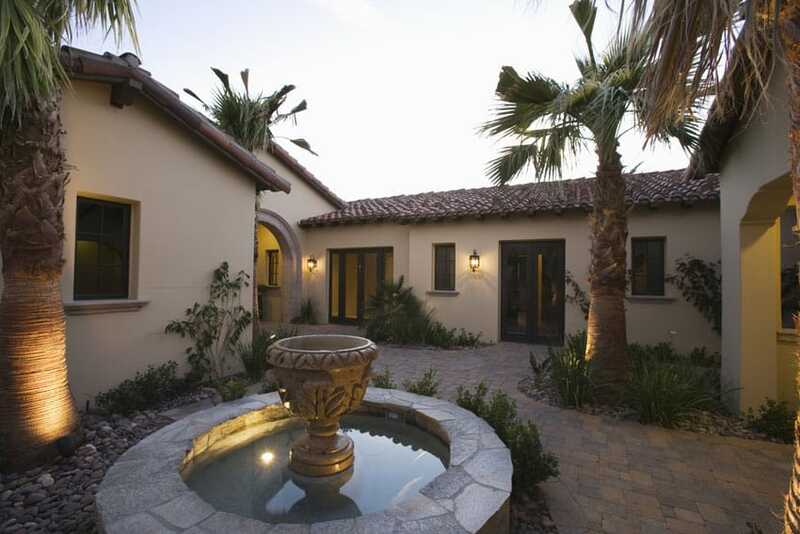 Welcome to our collection of the best patio water features including fountains, waterfalls and ponds. There are a lot of ways to design interesting water features. 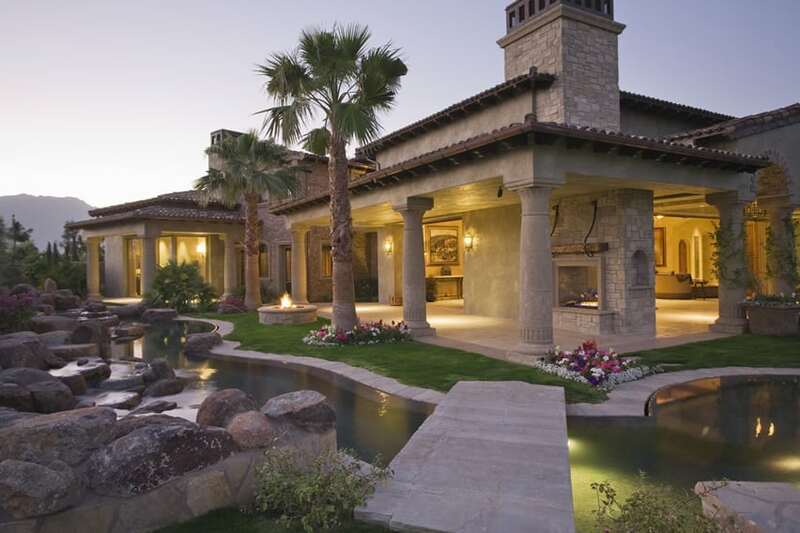 Some very common examples used in many landscape designs for homes include ponds, waterfalls, and fountains. Ponds are sometimes known as water gardens, especially when plant life is added to the feature. Homeowners will find it especially appealing to add some stylish aquatic plants into the mix as well as gold fish or koi if the climate is fitting. Ponds have been consistently been popular in landscape design from the very beginning, and for good reason. They’re relatively simple to maintain and would arguably be the easiest water feature or design element to implement in any garden design. Water features popped up in modern civilization as early as when the ancient Romans invented the aqueducts. Constant water flow and supply gave them some reprieve from the day’s heat as well as giving them clean and consistent sources of drinking and bathing water. Fast forward a couple of centuries and water features have developed into a sort of status symbol for modern architecture and design. In early modern Europe, you’d be hard-pressed to find any mansion of the wealthy without a fountain in its garden. 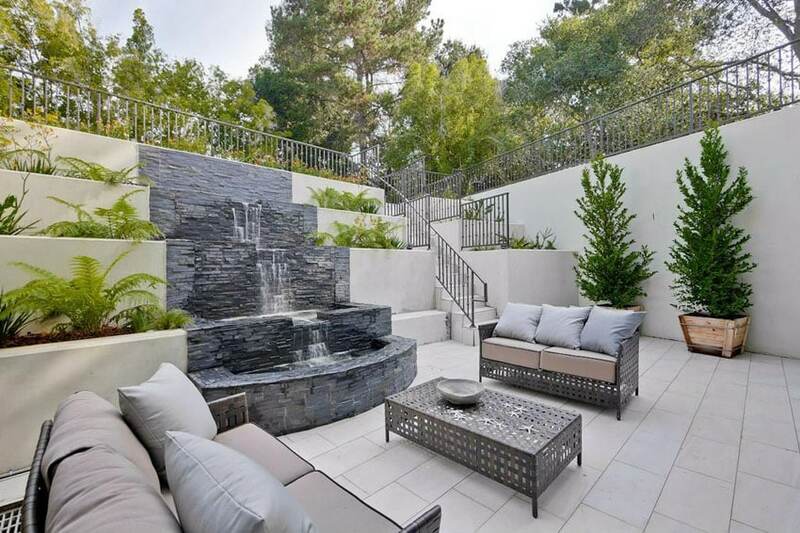 And nowadays, middle class residences will also often employ water features, typically small fountains or ponds with waterfalls into their design. Another common contemporary use of these design elements are in most municipal or public infrastructure. 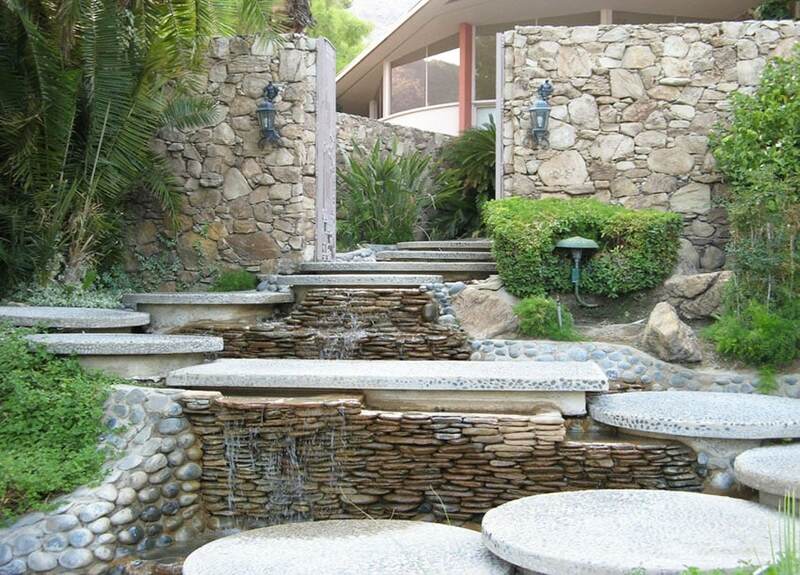 Two types of waterfall designs are particularly popular as of late: sheet waterfalls and pond-less waterfalls. The more popular one of the pair, the sheet waterfalls, uses block, brick or flat wall backings, usually with waterproof LED lighting for some stunning night-time views. 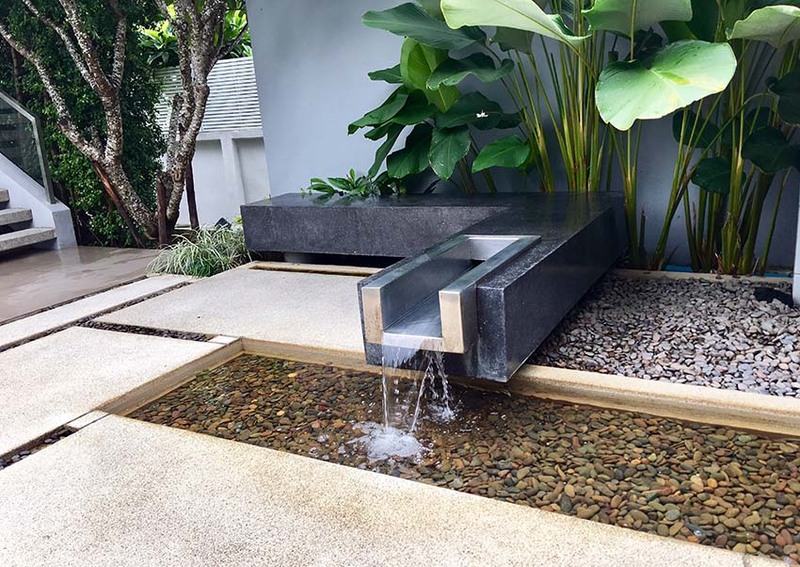 The resulting look is a clean, contemporary, modern water feature that goes well with any modern or Zen aesthetic that you might decide to go for. The reason why this type of waterfall feature is called a “sheet” is due to the look the water takes when flowing out of the wall backing. It flows out in a clean, smooth sheet before cascading to either a pond or gravel bed below. Pond-less waterfalls are exactly what they sound like. Sometimes known as cascading waterfalls, pond-less waterfalls fall into a gravel or pebble bed instead of a pond or water body below. The speed of the water falling affects the overall feel of this type of water feature. Make it too fast and the relaxing or meditative effect most water features try to go for is unfortunately lost. Nowadays, slower, more relaxing water flow has been a trend. They have a more calming, peaceful effect and suit the needs of an outdoor garden quite nicely. 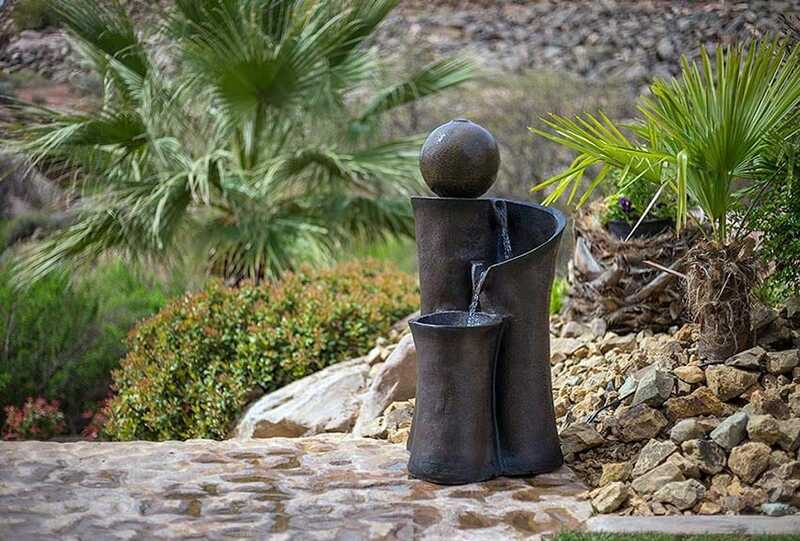 For fountains, there are two popular variants as well: bubbling fountains and rock column fountains. Bubbling fountains are boulder or vase landscape features with holes bored through their surfaces, typically at the topmost area, for water to be pushed through. Design can also get more creative with multiple holes bored through the boulder or several boulders or vases arranged together for more dynamic fountain effects. 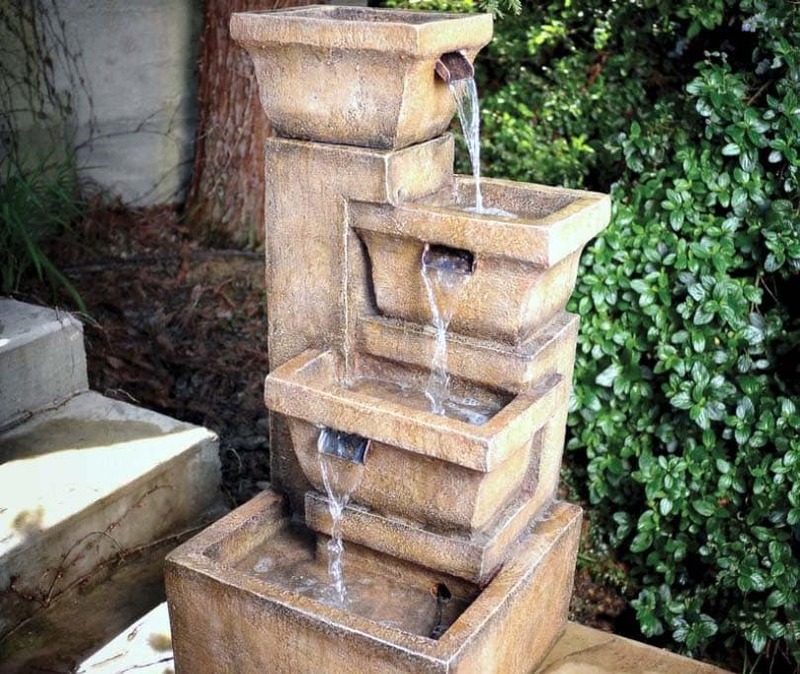 This type of fountain found its way into the hearts of many homeowners and home designers due to its simple design and its low cost and maintenance. Rock column fountains are slightly more pricey to pull off than their bubbly cousins, but have a more dramatic effect as well. Typically consisting of 3 or more large rock columns, it follows the basic concept of the bubbling fountains where a hole is bored through the topmost part of the rock column for water to be pushed through. The water cascades down the sides of the columns and lands on a bed of stones or gravel to be re-circulated to the top. In any case, the type of water feature you choose to use would vary depending on your climate, the look you are trying to achieve, and the cost considerations of your planned project. 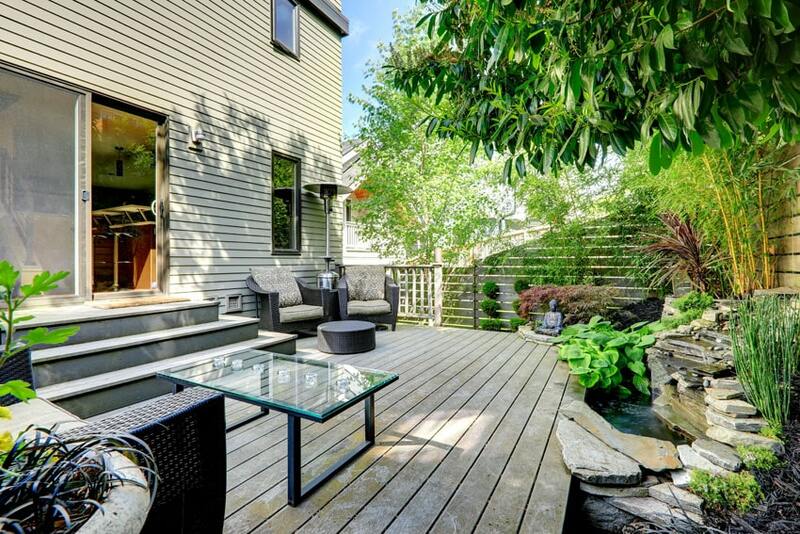 Water features are great for open terraces or outdoor deck patio setups such as this one. 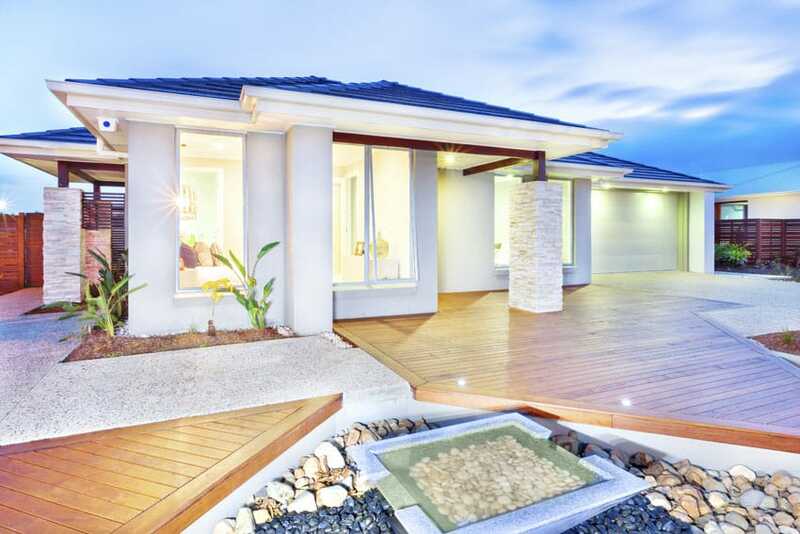 Careful choice and placement of ornamental rocks and gravel have a drastic effect on the overall look of the landscaping. Water basins and catch basins are great sculptural design elements that could be a wonderful addition to any water feature or outdoor garden space. 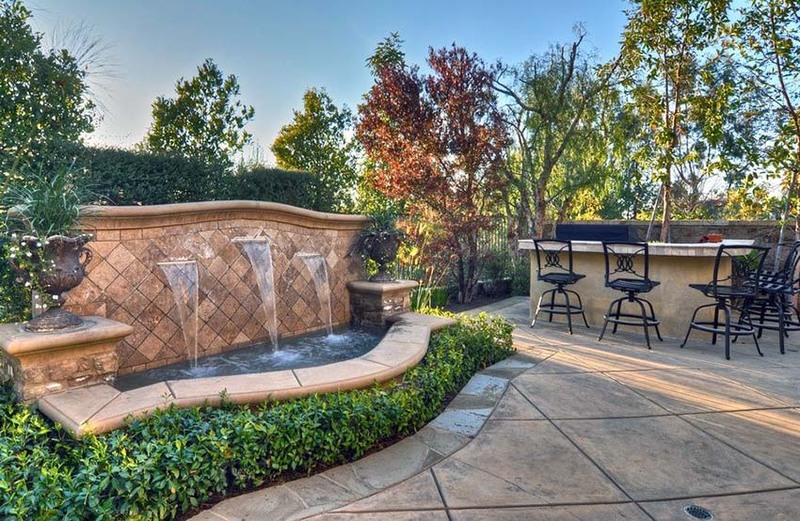 Larger fountains or pond features, especially radial ones such as the one featured above, can really solidify the design concept of a landscaped space by creating a cohesive design focal point. 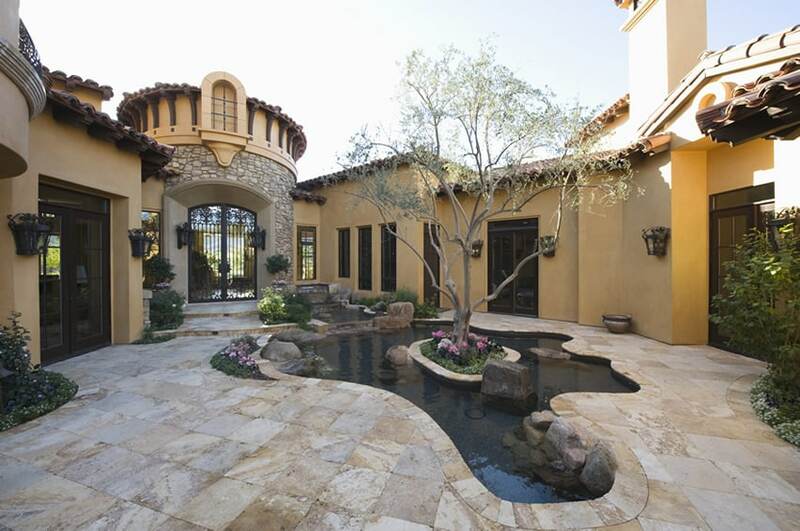 This luxury home is surrounded by a water feature pond similar to a modern moat complete with its own bridge. 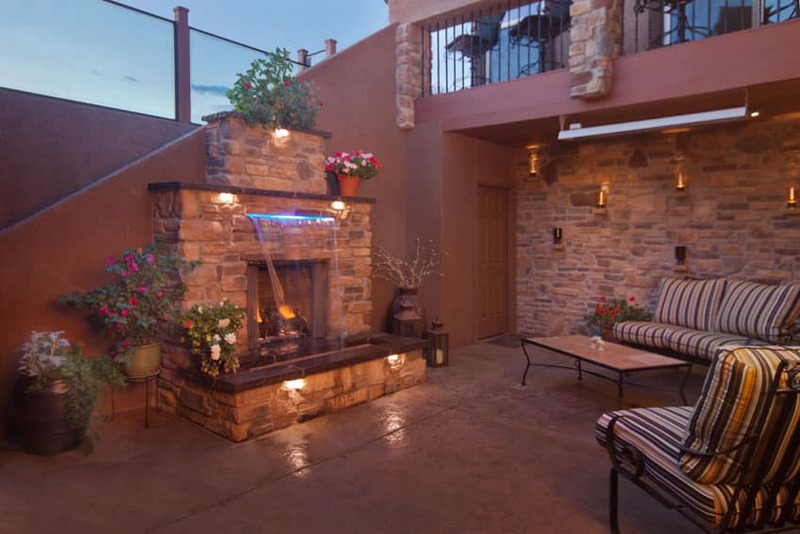 The patio area features an outdoor fireplace to create the perfect place to relax and socialize. 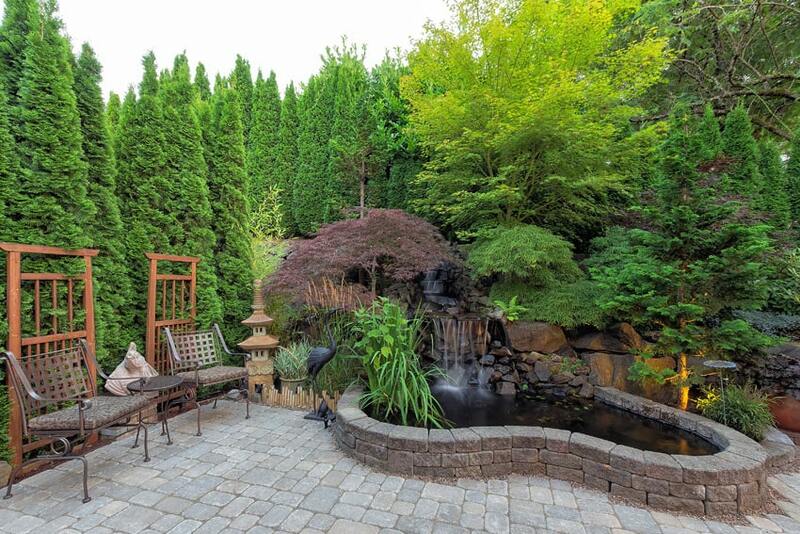 This inviting patio features a beautiful tropical landscape surrounding a mermaid fountain. You can get creative with your design features and integrate them with design element not typically seen together with water features. If a designer can pull off putting a fireplace underneath a sheet waterfall feature, the sky is truly the limit. 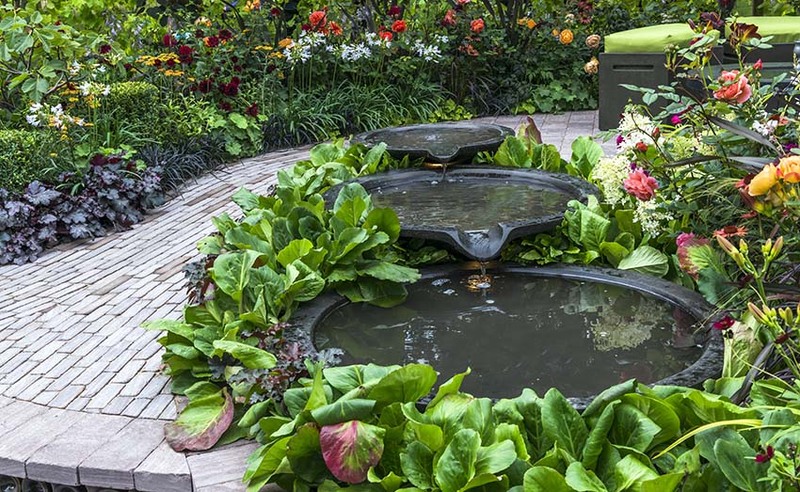 Free-form or organic pond shapes are great for more natural and welcoming garden spaces such as this one. Curvilinear forms have proven to be a lot more hospitable than sharp-angled ones. Cascading waterfalls work even better when levels or steps are integrated into the design. This works well for landscape designs built into rolling terrains or slopes. 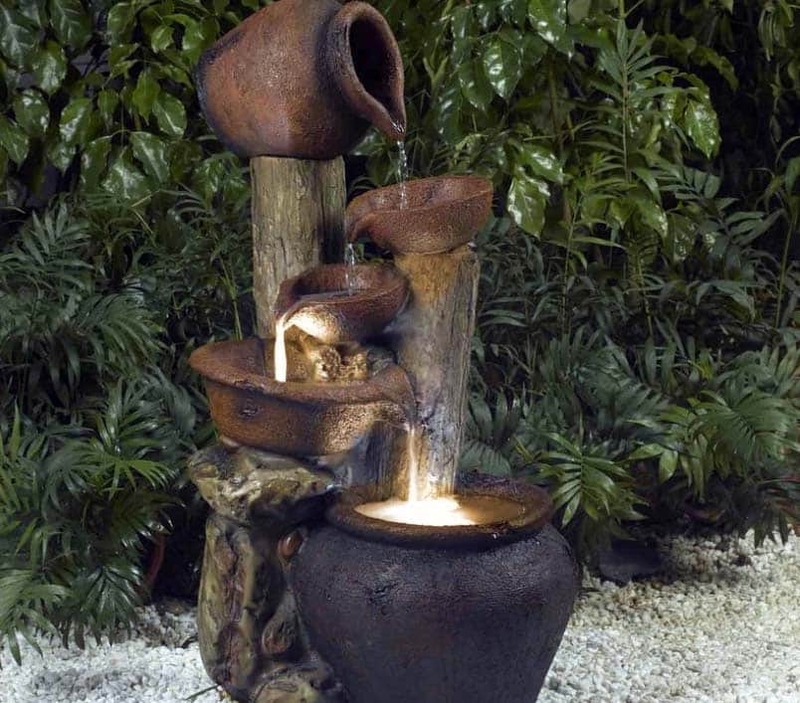 This pot bubbling fountain is one of many ways you can be creative with your patio water feature. 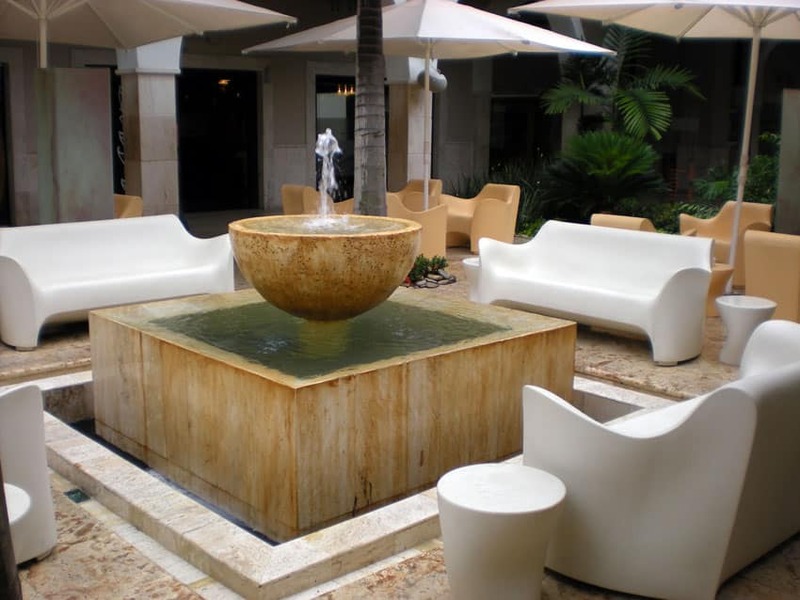 The cascading, multi-level water feature setup creates a relaxing ambiance suitable for outdoor areas you want to rest and relax in. 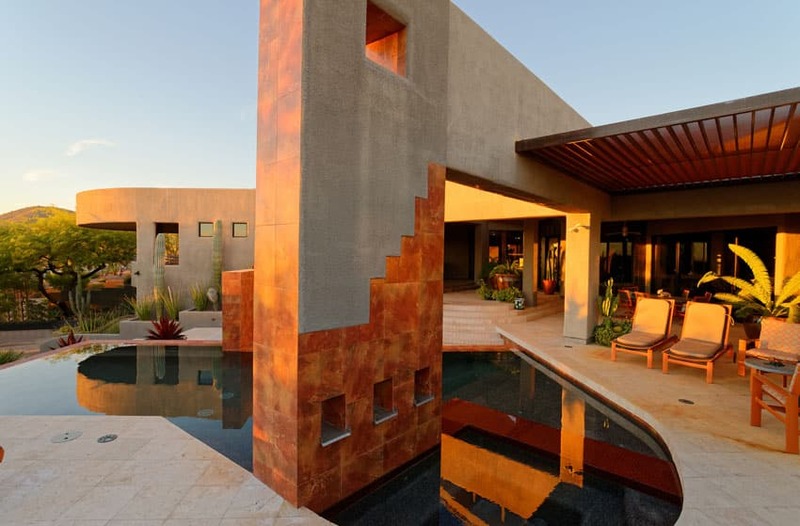 Large, bold water feature design elements such as this one are great when used as design centerpieces for outdoor patio spaces where you’d be expecting a fair amount of guests or visitors to lounge in. More contemporary, modern designs are suitable for modern home aesthetics. Sheet waterfall features and gravel bed ponds are tried and tested ways to really create a clean and neat look for your garden. 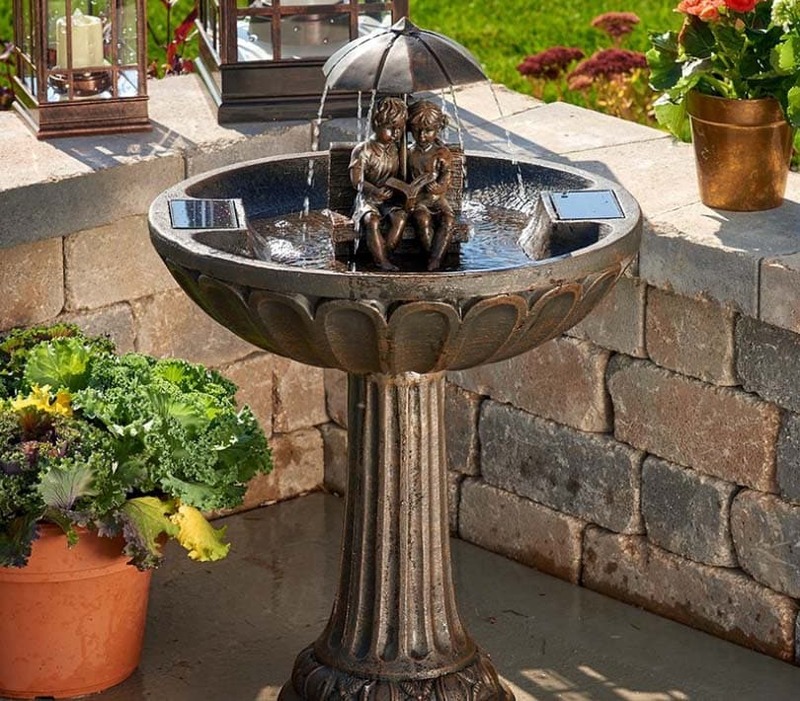 For that more sculptural, homey, and welcoming look, carvings and statuettes on traditional bird-bath style fountains can always be a great design direction to go on. Great plant arrangements are crucial in really giving some life to your water features. Plant them on, around, and in your ponds or multi-level waterfall features. Sheet waterfalls can be designed as a series of waterfalls instead of just one waterfall. Put this next to an outdoor bar setup or guest area for a pleasant lounging experience. More subtle pond or water feature designs can still make a large impact in your patio area or outdoor terrace. 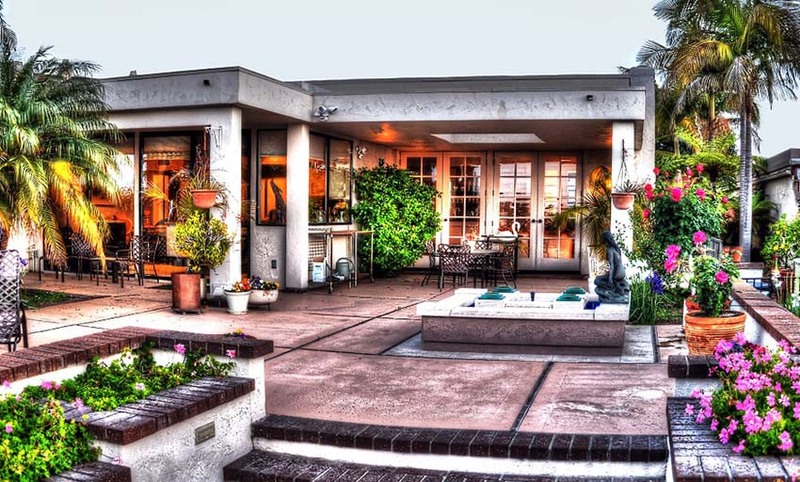 Put in some dramatic lighting designs and see your patio really pop when the sun goes down. Get creative with the forms of your water features. Try to find unique sculptural art pieces such as the sculpted form seen above to have yourself a conversation starter whenever guests come around. 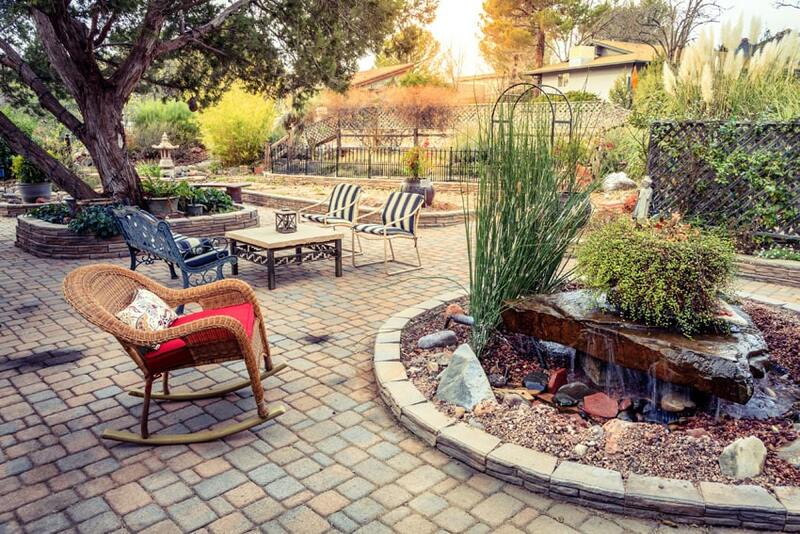 Tranquil ponds and rock arrangements in your water features are prominent in relaxing Zen style garden arrangements. The sound of the water and the sight of the stacked stones have an almost therapeutic quality to them. It’s important to make your water feature designs feel like they’re part of a whole. Play around with materials and forms but make sure they are cohesive to the overall design or feel of your house. Water features also need not be large, fixed installations. 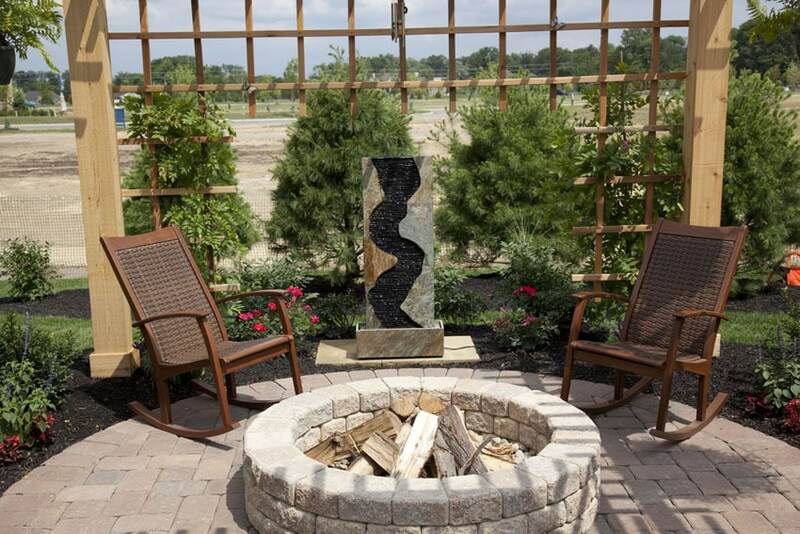 Stand-alone elements such as this plug and play bubbling waterfall feature can be a great supplement to your patio area. 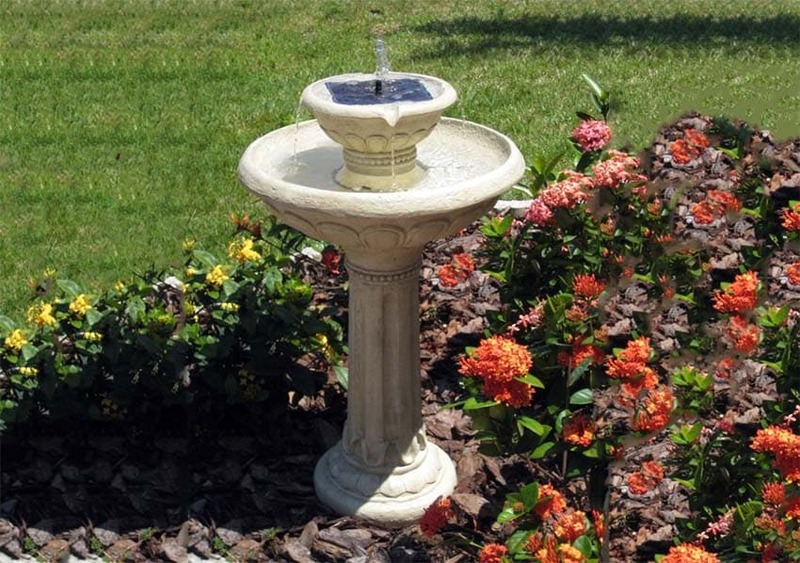 Bird bath fountains are always a great addition to any floral arrangement or backyard garden. 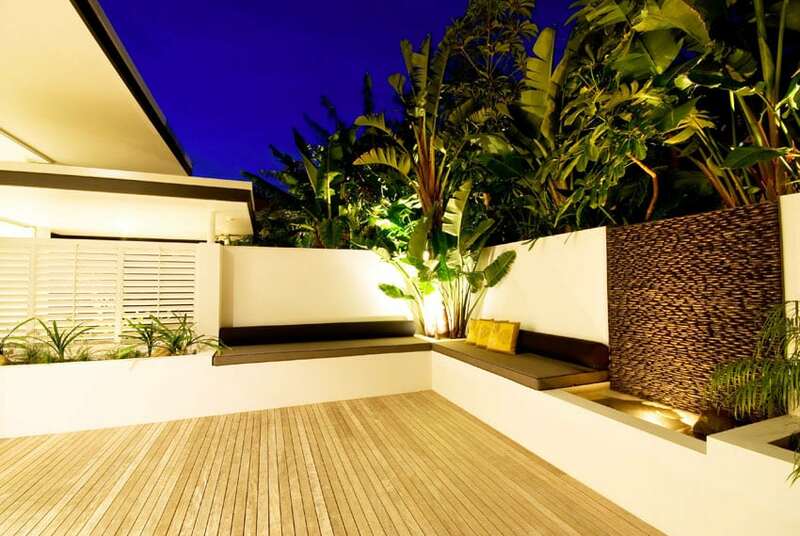 Their traditional design also make your outdoor landscaping seem stylishly nostalgic in a way. 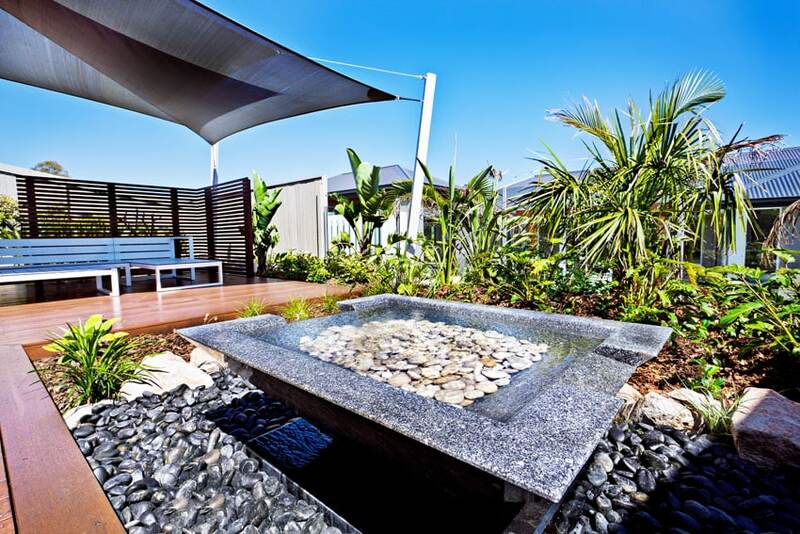 Instead of making your water feature its own independent element, you could also choose to integrate it into pathways or stairways for an even more interesting outdoor experience. One frequently underappreciated aspect of flowing waterfall design features is its ability to create tranquil white noise with the sound of its water cascading down. It’s soothing and is actually quite conducive to quiet group conversations. 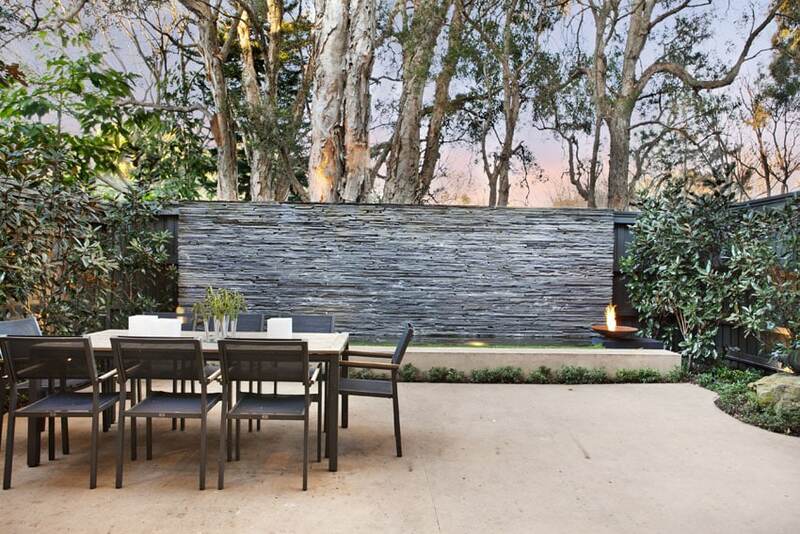 Accent walls in your outdoor patio are great partners to water gardens or koi ponds. You can use these design elements to hide unsightly background elements or to liven up your fence area. Multi-level cascading waterfall features can also be included with lighting to give it a drastically different look when turned on at night. Like with most landscape design, water features are made much more interesting when integrated into sloping or rolling terrain. 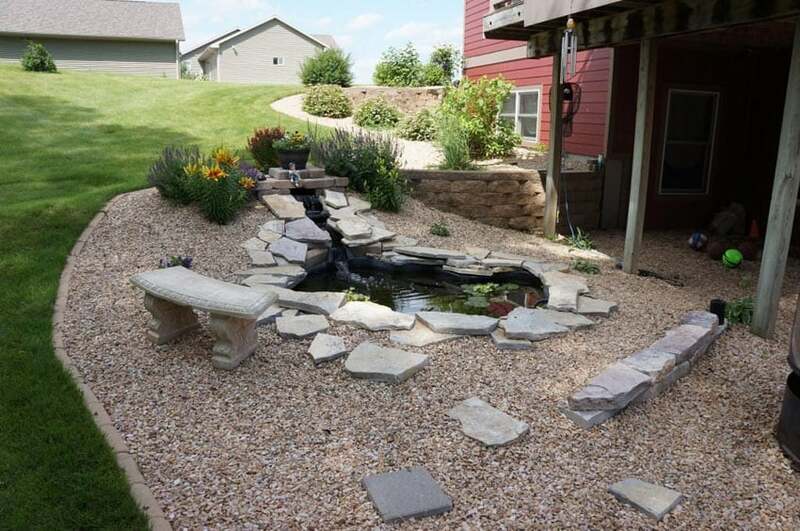 This example has a waterfall and pond feature integrated into its gravel pit with some interesting slate rock arrangements. The best designs don’t let size or space constraints dictate the quality of the space. 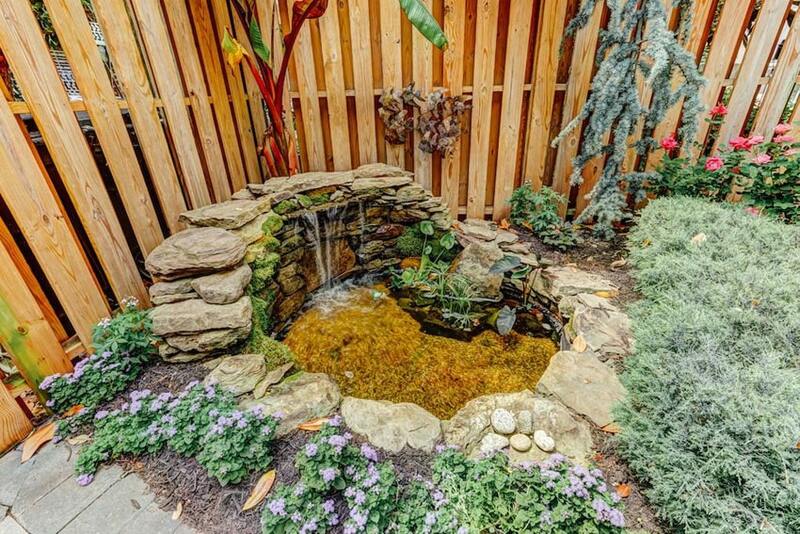 Even smaller sized waterfall-pond features or corner placements can turn out to be amazing pieces of landscape design.